Name the most iconic spy firearm ever and 9 out of 10 people will say the Walther PPK – the 10th person would be wrong. But the PPK was introduced in 1931 and almost zero changes have been made since…even a classic can use an update sometimes. The Bersa Firestorm .380 and Bersa Thunder .380 is that update. In a world of polymer gats that serve every possible role, the idea of choosing something heavy and made of steel might seem…old-timey. And it might well be just that, but that doesn’t mean it’s bad! While everyone knows who Walther or Colt is, Bersa isn’t really a popular name in the United States – even though the USA is the place to be for firearms, Bersa is just not huge in our market. They are, however, MASSIVE in Argentina where Bersa is based. Formed by Italian immigrants in the early 1950s, Bersa has been producing firearms for over 60 years. 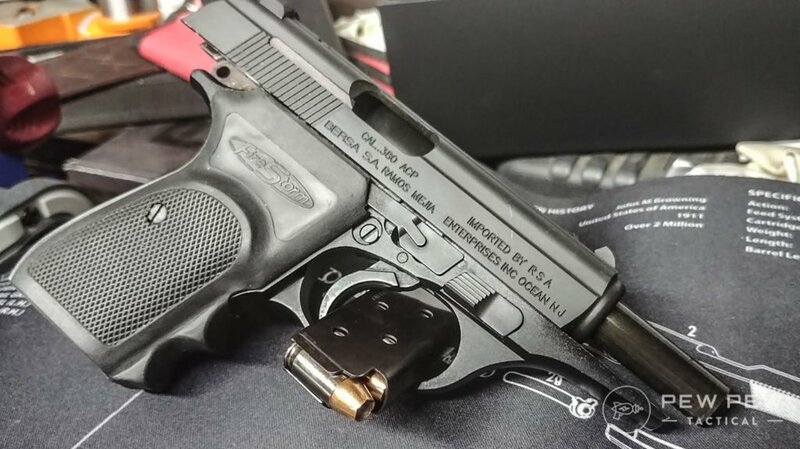 In 1994 they won a major contract with Argentina when the Bersa Thunder 9 was adopted as the standard issue pistol for the Argentina Armed Forces, Federal Police, and other agencies. Bersa’s two most popular models of firearms, in the United States at least, are the Thunder .380 and Firestorm .380. Really, pick what you think looks best and go for it. They take the same parts, the same magazines, and are effectively the same pistol – with some minor, mostly cosmetic, differences. Namely, the grips, trigger guard, and sights are different – but not massively so. The Firestorm has Finger Groves and Over-Sized Rubber Grips, the Thunder does not. 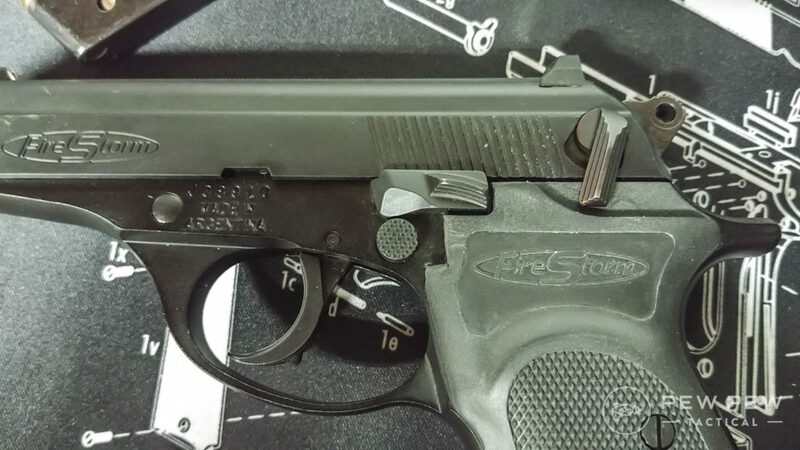 Firestorm Trigger Guard is rounded, the Thunder is scalloped and serrated. Firestorm sights are Glock-like with a dot front post and U outline rear sight, the Thunder is simple 3-dot. Otherwise – it is the same gun. And are roughly the same price. I bought a Firestorm because it is on the CA roster and the Thunder is not (don’t ask me why, just California things). Outside of these differences…I can’t find anything. And I’m honestly at a loss as to why there are even two versions of this gun. 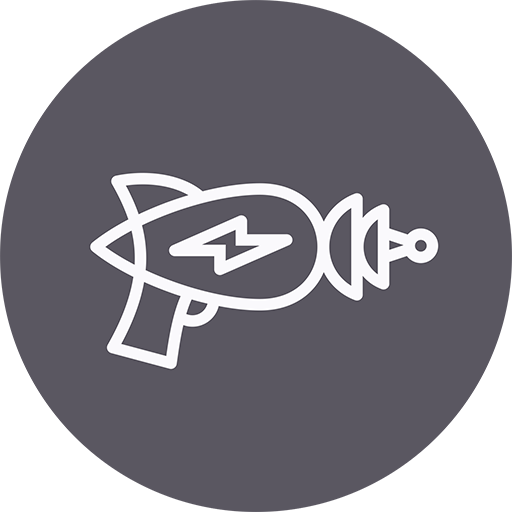 First off – holy dry gun batman. Handling it in the store, I was worried about it. 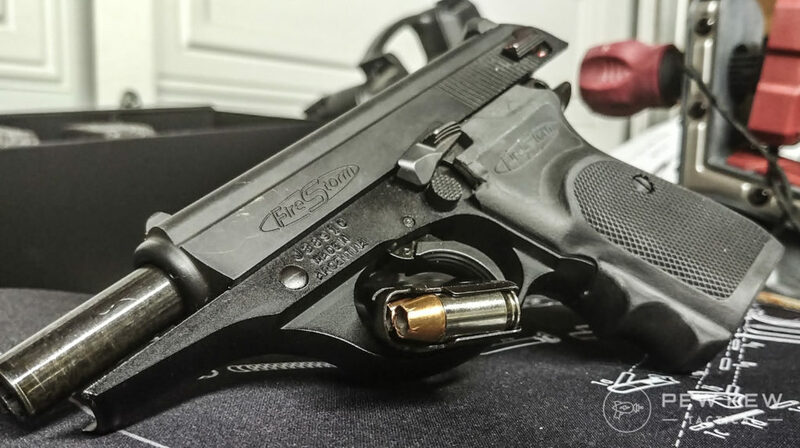 Bersa ships these guns bone dry and the lack of even the slightest hint of lube really makes them feel rough in the FFL, but for the price and the fact that I just really wanted a PPK-style gun – I rolled the dice and got it. Once home I was able to clean it and lube it, that made a world of difference! Bersa Firestorm, lubed and ready for the range. Everything smoothed up nicely and the function of the gun is great now. You can tell this isn’t a high-end gun, but it is a lot nicer feeling and finished than what the price would lead you to believe. The quality of the gun is much higher than I expected for the price – the internals show where they cut their cost in that the finish quality inside isn’t outstanding, but it isn’t budget either. For the outside, it’s very well done but the corners are a bit sharp – especially the decocker. 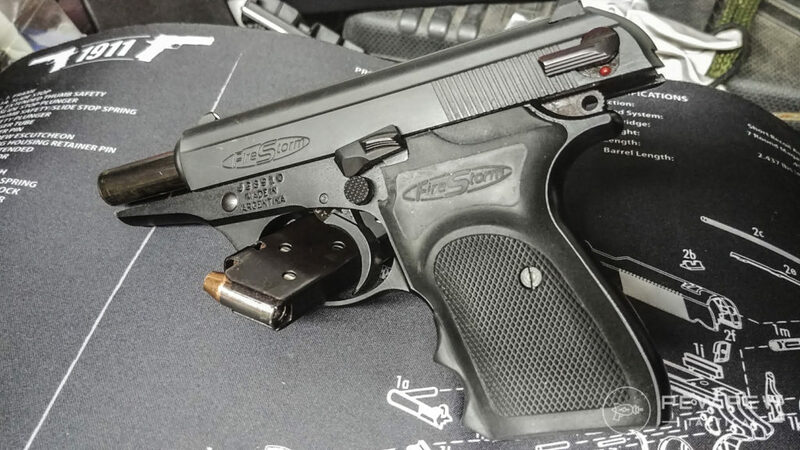 As a whole, the Firestorm feels solid in the hand and smooth to handle with a manual of arms much akin to a downsized Beretta 92 series pistol. I have one real issue with my Firestorm, but it was easy to correct – although it did require some minor Gun Surgery on my part. Namely: it has a Magazine Safety. While some people actually like the magazine safety and California requires it for most pistols sold by an FFL – there is nothing on a pistol that I hate more than this cursed “feature”. My belief lies fully in the camp that says magazine safeties make a gun less safe to handle and are entirely pointless in a self-defense or tactical situation. Any gun I own that has one gets it removed the first day I own it. The Firestorm was no exception. Thankfully, like most mag safeties, it was easy to remove. Not saying you should do this…but if you want to…unscrew and pop the right grip panel off the gun, lay it flat, look at the bottom left-hand corner of the grip. You’ll see a C shaped cut out with a flat spring in there. Use a punch and some muscle and you’ll be able to get the spring out…or if you don’t care about preserving the spring, needle-nose pliers and a good yank will pop it out a lot faster. That’s it. You’re done. Replace the grip panel and enjoy a un-lawyered firearm. My first trip to the range with a new gun I always bring as much ammo as I can carry and from at least a few different brands. I put 300 rounds downrange that first trip – zero malfunctions, zero failures, zero issues of any kind. Everything ran perfectly! Even the defensive JHP Sig Sauer V-Crown ammo ran perfectly. This little Bersa ate everything I gave it and left me very pleased. You should know (if you don’t already) the Bersa Thunder and Firestorm are both DA/SA guns. That might be a hard no no for some, but it is actually my preferred type of pistol. My main competition gun (also my main carry sidearm for hunting, hiking, etc) is a Beretta 92FS with several Wilson Combat upgrades in it. So for me, I’m used to and like the DA/SA style manual of arms and the Bersa Firestorm matches up in handling almost perfectly to my Beretta 92FS. 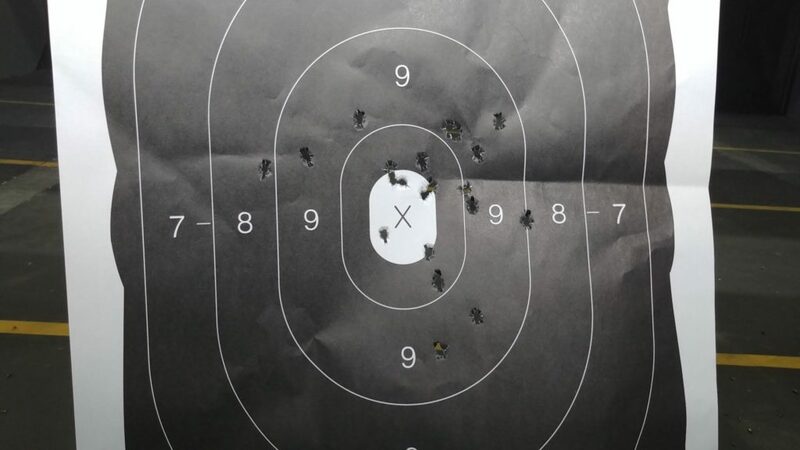 Where I live to get a CCW permit you need to be barely minute-of-bad-guy to pass your CCW course (70% in the black of an NRA B-29 target, you know – the full human torso sized target police use) but I expect better of myself and of my firearm. Even though the Firestorm is small, has a tiny sight radius, and a real snap to the recoil – it shoots true. Not a group that would win the Olympics, but more than enough to protect yourself with against a bad guy. Sig’s V-Crown HP ammo also performed well, shooting a much tighter group and with zero feed issues common to JHP ammo. 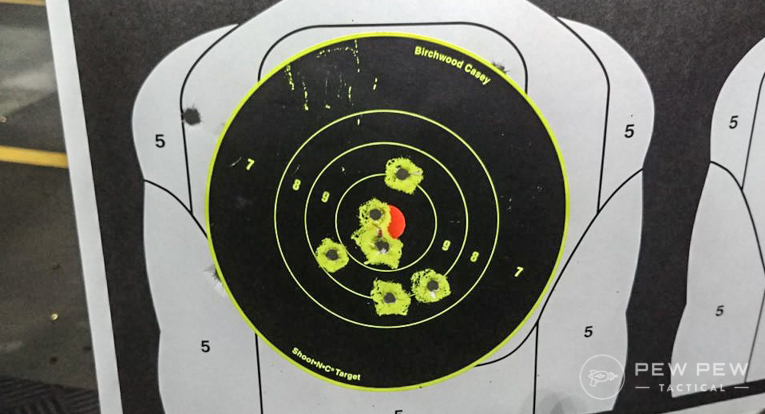 The vertical stringing was clearly my shooting and the fact that it was a bit low was on purpose, the back of the target was getting shot out so I shifted my aim down a bit to preserve the backing. Very nice grouping though from the ammo, I am quite pleased with both the ammo and the fact that this little pistol was as on target as it was. Even the sights are on point and sending rounds exactly where I think they will go – right out of the box. What surprised me the most was that my POI didn’t really shift between the two types of Sig Sauer ammo. Two different types of bullet, two different weights (10-grain difference but still) and the POI was spot on with both. Nice if you’re looking to train with Sig FMJ and carry V-Crown. 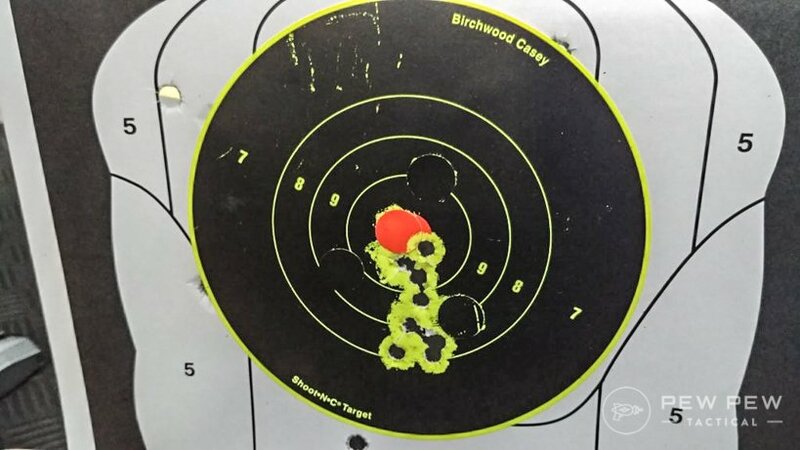 Since I am getting ready for my CCW course, I decided to splurge at the range and buy an NRA B-29 target to see how I faired against it. The course of fire for my city is 1 magazine each at 15, 10, and 7 yards. My indoor pistol range maxed out at 14 yards, so that’ll have to do for now. For a CCW sub-compact pistol with a 3.5-inch barrel, I am happy with a score of 197/210. I could do better, but I was 250+ rounds deep already and my wrist was getting ready for a break. But while I was pleased with my Bersa, my hand and wrist aren’t. .380 ACP isn’t what most people would consider a powerful round, and it isn’t. But combined with a very small CCW pistol even .380 can be snappy. After 300 rounds in about 2 hours of shooting – the Firestorm had chewed my hand up a bit. 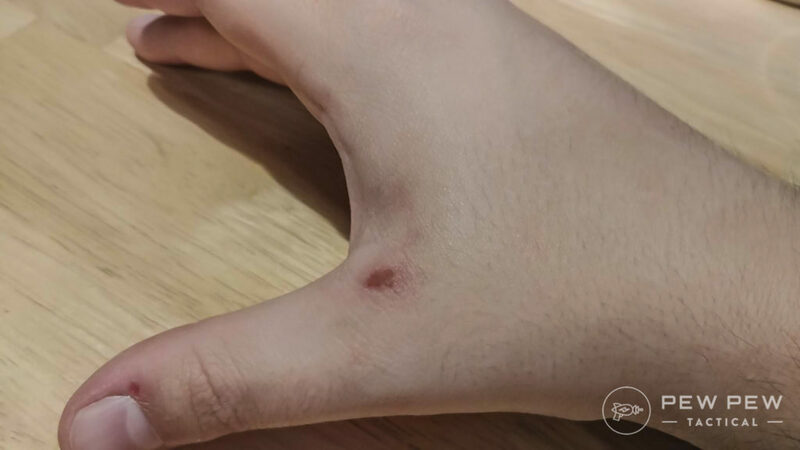 My hands aren’t soft, I go to the pistol range regularly and have the hands to prove it, but even so – 300 rounds of snappy recoil left me with a small patch of skin missing and a sore wrist. While I trust this little gun for a CCW and wouldn’t have an issue shooting it to protect myself, it is clearly not something I would take to the range just to plink with. After about 250 rounds is when I noticed the missing skin, I keep gloves in my range bag and with my Pig FDT glove on, I felt almost zero of the recoil and made for a much more comfortable shooting experience. If I was going to take this plinking or to a long CCW class, I would absolutely wear the gloves for it. But for a standard time-to-eat-my-vegetables at the range practicing with my Bersa – I’d leave them off for anything under about 75 rounds per session. Well over 300 rounds now of a mix of ball, HP, and ballistic tip rounds – zero failures of any kind with any ammo. Remington UMC was dirty to shoot but worked well for practice ammo. Sig Sauer FMJ was clean and wonderful to shoot groups with (and is what I plan on using during my CCW qualification test) while the Sig V-Crown is my planned on carry ammo. 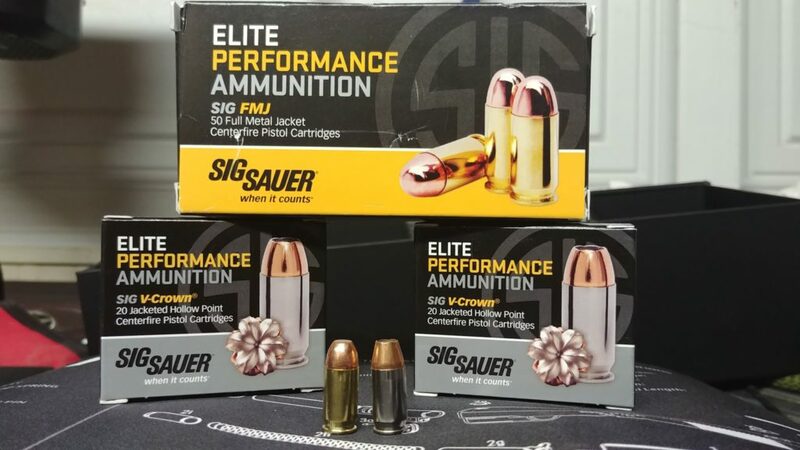 LuckyGunner has tested the Sig V-Crown .380 Ammo and their report is very positive! For a sub-compact CCW weapon, the accuracy is remarkable and on par with many full-sized firearms. You might need to adjust your grip a bit, but find what works and stick with it. Do your part and the gun will drill holes where you want them. I have large hands and most compact or sub-compact guns are very hard or impossible for me to get a good grip with, the Bersa Firestorm didn’t present that problem for me. The overmold grip, the finger grooves, all of it matches up well for me. The only issue I had was the magazine release is set high and forward. While this keeps it out of the way, it is a bit of a reach (even for me) to be able to use. Granted, speed reloads aren’t something you generally look for in a CCW gun – so this isn’t a huge deal to me. The over-molded grip also runs to the very edge of the magazine release, with my hands and my grip that made pressing the mag release harder than I would like. I took a razor to the rubber grip and snipped it back a little so that the mag release is more exposed, making it far easier to press and release. Classic Walther PPK style looks, I dig that a lot. Every time I go to the range with it I have the Bond theme in my head for that first magazine down range. Bersa isn’t a huge name in the game and the options for the Thunder and Firestorm are limited at best. So far I haven’t found a reliable source for aftermarket sights that work with the gun and I would really like to since night sights on a CCW is a big deal to me. There are 3rd party magazines for it, but I’ve heard horrible things about them. Thankfully, Bersa makes 7, 8, and 9 round magazines that are dead on reliable. There are some grip options floating around made by Bersa and other brands, but outside of that, your options to customize are almost non-existent. Holsters seem to be the easiest thing to find – Alien Gear, Crossbreed, and more have options. I paid $340 out the door in California for a brand new Bersa Firestorm .380. For the rest of the nation, it can be had for as little as $250-ish out the door. At that price, for the features it offers, the quality of manufacture, and the ease of use – this is a great value. I am outstandingly happy with mine and would highly recommend it. All things considered – I really like this gun. Metal frame, DA/SA, .380, 100% reliable, and it was surprisingly cheap. That covers every single box I was hoping to check when looking for a CCW pistol. The question most people ask when it comes to CCW guns is “Is it the best?” I find that a weird question to ask since…there isn’t a best. Just a best for you or a best for me. I like the Firestorm and if it roughly matches what you’re looking for in a CCW, I would recommend you try it out. I’ll be honest, I wish this was a Walther – but sadly Walther isn’t making a PPK 2018 edition and the standard PPK is simply…dated. If Walther ends up making a new version of the PPK, I’ll wait in line overnight to try it. But until then my Bersa fills that itch I have and serves my needs in nearly every way I could ask for in my CCW gun. If you want even more CCW options – take a look at our Best CCW Pistols By Caliber article! What do you choose – DA/SA, striker fired, or SA? Do you carry a Bersa Thunder or Firestorm also? Let me know in the comments! Check out more of our favorite guns and gear in Editor’s Picks. I have the .22 version and the .380. The .22 is ammo fussy, but very reliable with good high velocity ammo. It works great for handling practice instead of beating up my hand with the .380 and saves some money at the same time. The review is right on, and it is a good choice for the cost. Great article. I have the Bersa 380 FireStorm and really like shooting it. On my CCW qualification, the Bersa failed. There are some issues with with it that were fixed by the gunsmith and I qualified the gun afterwards. Depending on who you ask, some love it, some are negative about it. I like the size and form, very similar to the Walther PPK as noted by the author. Good CCW firearm, I’m looking forward to carrying it.